LOx/Kerosene propellant rocket stage. Configuration as flown. Thrust: 38,703.16 kN (8,700,816 lbf). Gross mass: 2,286,217 kg (5,040,245 lb). Unfuelled mass: 135,218 kg (298,104 lb). Specific impulse: 304 s. Specific impulse sea level: 265 s. Burn time: 161 s. Height: 42.06 m (137.99 ft). Diameter: 10.06 m (33.00 ft). Span: 19.00 m (62.00 ft). Cost $ : 391.500 million. No Engines: 5. Saturn S-IC-8 LOx/Kerosene propellant rocket stage. .
Saturn IC C-3B LOx/Kerosene propellant rocket stage. Final first stage design of Saturn C-3 (November 1961). Saturn IC C-4B LOx/Kerosene propellant rocket stage. Final first stage design of Saturn C-3 (November 1961). 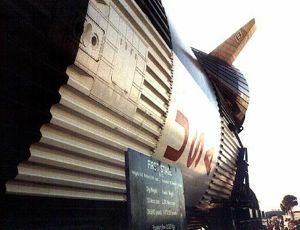 Unique S-IC design in that fuel and propellant tank shared common bulkhead; stage was actually shorter than C-3B S-IC. Saturn IC C-5A LOx/Kerosene propellant rocket stage. Final first stage design of Saturn C-5 (November 1961) before selection as Apollo launch vehicle and development in Saturn V.
Saturn IC-Flat Bulkhead LOx/Kerosene propellant rocket stage. Standard S-IC but with reduced length and structural weight through use of 'flat' bulkheads consisting of multiple conical sections. Saturn MS-IC-1A LOx/Kerosene propellant rocket stage. Basic Saturn IC stretched 240 inches with 6 F-1 engines. Saturn MS-IC-4(S)B LOx/Kerosene propellant rocket stage. S-IC with 336 inch stretch, 6,000,0000 lbs propellant, structural strength increased from 56% to 65% depending on station, resulting in 13.9% increase in empty weight. Saturn MS-IC/260 LOx/Kerosene propellant rocket stage. Standard length S-IC but with feed of propellant from fuel and propellant tanks housed above strap-on solid rocket motors. Saturn MS-IC-1 LOx/Kerosene propellant rocket stage. Basic Saturn IC stretched 240 inches with F-1A engines uprated 20% in thrust and 6 second improvement in specific impulse. Saturn MS-IC-23(L) LOx/Kerosene propellant rocket stage. Basic Saturn IC stretched 240 inches with standard F-1 engines. 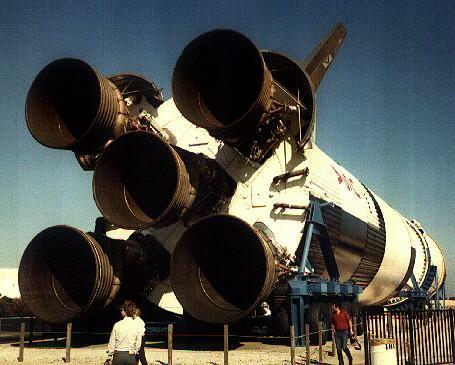 Saturn MS-IC-3B LOx/Kerosene propellant rocket stage. S-IC with 20 foot stretch, 1.8 million lb thrust F-1's, 5.6 million pounds propellant capacity (fuel offloaded to 4.99 million for LEO or 4.80 million lbs for LOR mission). Saturn S-IC-TLB stage LOx/Kerosene propellant rocket stage. Boeing Low-Cost Saturn Derivative Study, 1967 (trade study of 260 inch first stages for S-IVB, all delivering 86,000 lb payload to LEO): S-IC Technology Liquid Booster: 260 inch liquid booster with 2 x F-1 engines, recoverable/reusable. Saturn S-ID Sustainer-1 LOx/Kerosene propellant rocket stage. Boeing studies, 1967:'Stage and a half' S-1C with four outboard F-1's jettisoned and inboard F-1 functioning as sustainer as in Atlas; 20 foot stretch of sustainer stage. Booster stage burn 154 seconds in this configuration. Saturn MS-IC-25(S) LOx/Kerosene propellant rocket stage. S-IC with 41.5 foot stretch, 6,640,0000 lbs propellant, uprated F-1 engines. Saturn S-ID Booster LOx/Kerosene propellant rocket stage. Boeing studies, 1967:'Stage and a half' S-1C with four outboard F-1's jettisoned and inboard F-1 functioning as sustainer as in Atlas. Booster half stage recoverable. Mass estimated based on double mass of four F-1's (based on Atlas example). Saturn S-ID Sustainer LOx/Kerosene propellant rocket stage. Boeing studies, 1967:'Stage and a half' S-1C with four outboard F-1's jettisoned and inboard F-1 functioning as sustainer as in Atlas. Booster half stage burns 124 seconds in this configuration. Country: USA. Engines: F-1. Launch Vehicles: Saturn V 2, Saturn MLV-V-4(S), Saturn V, Saturn INT-20, Saturn INT-21, Saturn V-A, Saturn V-Centaur, Saturn Shuttle. Propellants: Lox/Kerosene.